The DMON-16S from Decimator Design is a low cost, miniature 16 to 1 Multiviewer. The 16 SDI inputs are independent of each other, meaning you can monitor a mix of 3G/HD/SD feeds. Select from preset layouts or customise your own, depending on the number of feeds you wish to monitor. For a "Lite" version of the DMON-16S, see the DMON-16SL. DMON-16S comes with a Locking DC Power Supply, USB Cable, HDMI Cable & Mounting Bracket. Warranty for all Decimator Design products is 3 years. 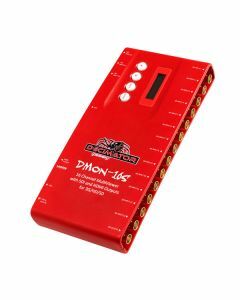 The DMON-16S is a truly portable converter, that incorporates our new easy to use LCD and button control system. This gives you easy access to most of the amazing features without using complicated LED/button control, dip switches or having to carry around a computer to change a simple setting.